Gay History is important. We would like to give a shout out to Rich Hawkins, HuffPost Gay Voices, for his recent editorial, The Gay Community is Dying, Here’s Why it Needs to Live: a compelling explanation for why our past matters. Calgarians understand this and came out in huge numbers for our history walking tour at Pride 2014 – but it created some logistical complications for us. Consequently, we did a rethink about our presentation and working with Pride Calgary have created an online ticketing system. You can sign up now, on a first-come, first-served basis, for the two scheduled history walks on offer. Tickets are free (donations are welcomed), and if we fill up these walks we will consider adding more to the Pride Week schedule. Join the Calgary Gay History Project’s Kevin Allen on a walk through the Beltline. We will travel to significant historical gathering spots for the gay community in this inner city neighbourhood, including Calgary’s first gay bar, from 1968, Club Carousel. Everyone welcome. Tickets: here. 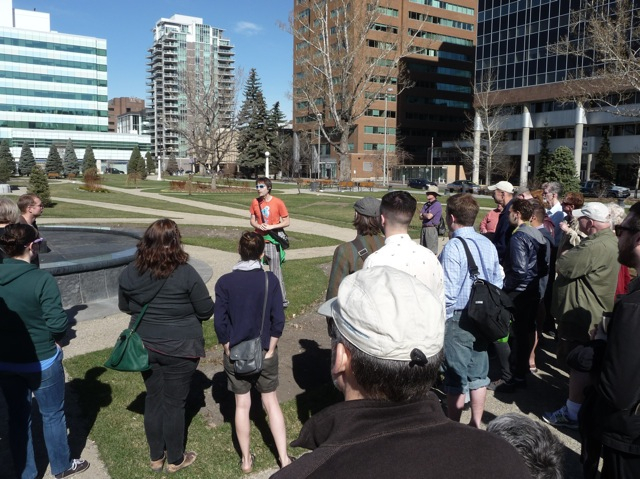 Join the Calgary Gay History Project’s Kevin Allen on a walk through the city centre. We will highlight significant political and social events that affected the gay community. On the way we will pass by several historical watering holes where gays and lesbians gathered. Everyone welcome. Tickets: here. We hope you join us walking in September!